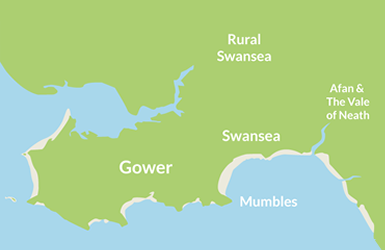 With its urban, rural and coastal location, Swansea Bay is the home of family adventures. You can learn to surf on Britain’s best beach, explore the Gower Peninsular (Britain’s first designated Area of Outstanding Natural Beauty) by boat or via the picturesque Wales’ Coast Path, brave zip wires, discover a tropical paradise, have fun in Wales’ largest water park, leisure and gym complex, and explore our state of the art, interactive museums. If that sounds right up your street, you’ve found the perfect place, and all the family is welcome – even those with four legs!